DETROIT -- General Motors Co. said Thursday it is prepared to purchase $2.1 billion of preferred stock held by the U.S. Department of Treasury upon completion of its public offering. 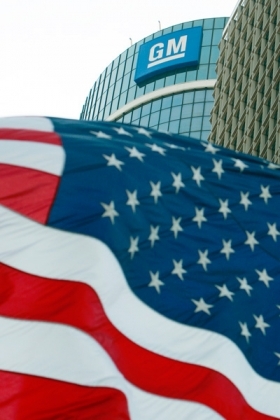 The move marks another step by the automaker to repay $49.5 billion in federal bailout funds. The automaker outlined a series of other actions Thursday that include a new round of contributions to U.S. pension plans and repayment of $2.8 billion outstanding on a note provided to the UAW Retiree Medical Benefits Trust. The automaker previously repaid $6.7 billion in outstanding government loans, and just over $700 million in dividends and interest. After the government's $2.1 billion preferred shares are purchased, GM will have repaid $9.5 billion to the federal government. “They're trying to clean up their balance sheet to get it as clean as possible before the IPO,” Rebecca Lindland, an analyst at IHS Automotive in Lexington, Mass., told Bloomberg News. GM said the purchase of the preferred stock held by Treasury will be at a price equal to 102 percent of the $2.1 billion liquidation amount. As a result, the company will record a $700 million charge -- attributable to common stockholders -- for the difference between the purchase price and the recorded value of the Treasury's preferred shares. GM will also record a $200 million non-cash gain in the fourth quarter of 2010 related to the retirement of the UAW Retiree Medical Benefits Trust debt. The automaker plans to contribute at least $4 billion in cash and $2 billion in GM common stock to its U.S. hourly and salaried pension plans following the completion of its initial public offering -- anticipated next month. “These actions will bring down our leverage by $11 billion by reducing debt and improving our pension funding position,” GM CFO Chris Liddell said in a statement. The pension contributions are contingent upon Department of Labor review, and the number of shares contributed will be determined based on the public offering price for GM's common stock. Separately, GM said it plans to terminate an agreement which provides for accelerated receipt of payments made by financial institutions on behalf of U.S. dealers under wholesale financing arrangements. Under such arrangements, GM dealers borrow from financial institutions to fund their inventory of vehicles purchased from GM. Similar modifications will be made in Canada, the company said. The so-called ‘wholesale advance agreements' cover the period when vehicles are in transit between assembly plants and dealerships. Upon termination, GM said it will no longer receive payments for vehicles purchased by the dealers in advance of the scheduled delivery date. The move will result in an estimated $2 billion increase in GM's accounts receivable balance, on average, depending on sales volumes and certain other factors in the near term, the automaker said. GM also said the related costs under the arrangements will be eliminated.